Theme from Fanfares et Simphonies (Jean-Joseph Mouret, 1729). Two basic triangle-wave voices, MSK 008 VC Octave Switch patched as a wavefolder and applied to one of the voices. MIDI velocity controlling the input amplitude to the wavefolder, steadily increasing the amount of folding over the course of the clip; a sine wave from the MSK 010 Fixed Sine Bank is added to the wavefolder input (using the second channel of the MSK 008 as a unity mixer) to create some extra phase modulation/chorus effect. This is all MIDI-controlled, with no human intervention needed after pushing the button to start the sequence. 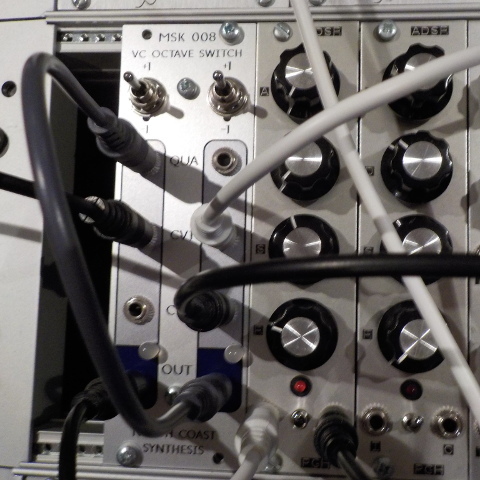 Note the module shown in the photo is a prototype with the add/subtract channels swapped; the production module can do this effect too but would need mirror-image patching.